I've read that you should make 10 games before you reach success in game development. This isn't a strict value I'm guessing or any kind of hard and fast rule. However, I do feel that it's in a game developer's best interests to make as many games as possible. Partly to hone one's coding skills but mostly to understand what makes a game interesting and fun. It's also an important journey of self discovery, to understand one's talents and limitations. I wrote many games on the spectrum, however none of them were what I would call "Finished" apart from the game I've listed here. Unfortunately, nothing remains of any of them, it was over 20 years ago. The rest of the games were for the PC platform and more recently for mobile devices..
ZX Spectrum. A platform game where you collect treasure in a scrolling maze like level to activate an exit which would appear after you'd collected enough treasure, all while avoiding traps and using teleports to move you to the next platform above. Perilous spike pits would plague your every fall. The game included an editor where I would challenge a friend with a cunning level and he'd return the favour with an even more cunning level. This game was memorable to me because of the large levels, the large sprites. I had to write a Run Length Encoding compression system in Z80 (before I knew what RLE was) to fit the levels into memory. The game was fast and allowed for very devious traps. Even though the gameplay was simple, it was a lot of fun. 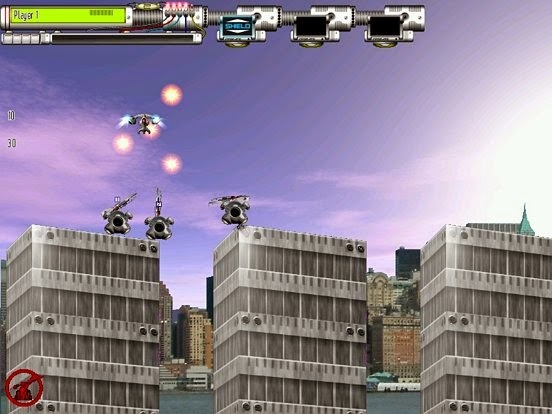 A vertically scrolling shooter where you must defeat an invading alien force using a previously mothballed fighter. You could collect weapons dropped from dead enemies, it had a variety of different aliens, each with their own abilities and tricks. There were also Bosses to defeat who also had their own patterns and abilities. CHAOS: Battle of the Wizards - Remake. A remake of the classic gameby Julian Gollop. 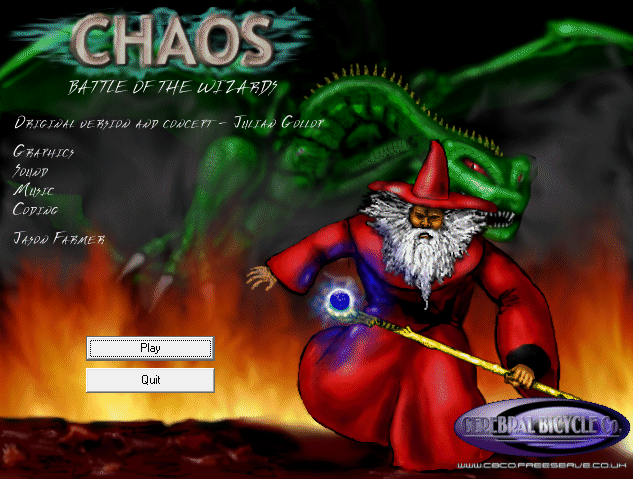 Chaos pits 2 or more wizards against each-other in a last man standing battle to the death. It was abandoned due to really difficult to track down issues in the code which would take a massive amount of work to fix. However the gameplay was faithful to the original with every spell and monster re-created. 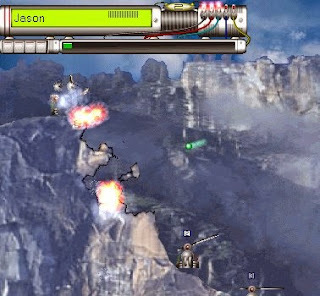 A turn based projectile warfare tank game where you control a squad of flying tanks who must fire at the opponents flying tanks on opposing mountain sides across a valley. 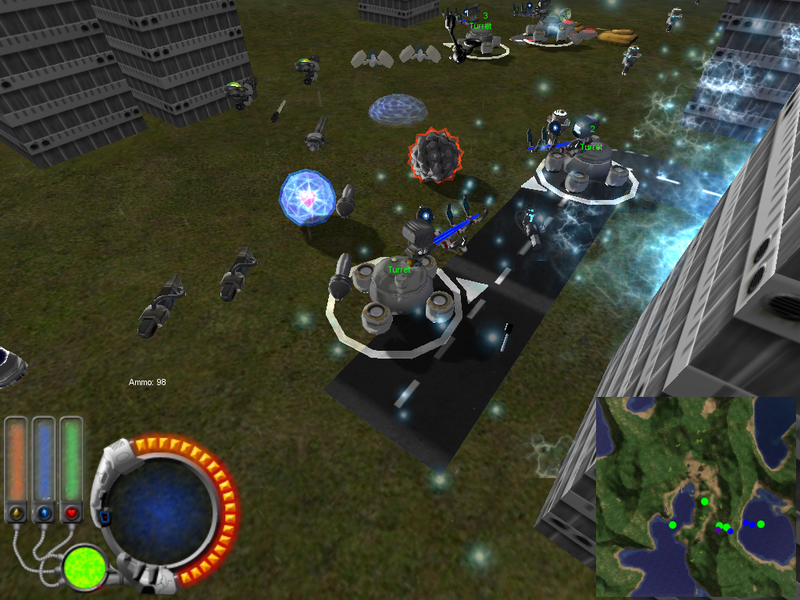 AI behaviour aimed the turrets of the enemy tanks and raised shields. Limited fuel reserves and accurate aiming of the AI opponent meant that battles were usually quick and devastating -often needing quick reflexes and tactical uses of the shield. The terrain was fully destructible and this was the first game I'd written with a floating camera which worked independently of the player's control. It moved to focus on the selected tank and would also follow projectiles through the air to see where they landed - allowing the player to adjust their aim. All in real time. The game was published as a demonstration of how to make games using the DelphiX component set. A rip in space has occurred following an unexpected situation during a science experiment trying to find a new source of energy to save our world from environmental disaster. The device causing the rip has fallen through the rift, it's up to you to retrieve it before the earth and the alien world perishes. An entire story arc was planned involving alien civilizations and a civil war which would complicate your efforts. It was a 2D platformer with skeletal animation - built from the ground up using a home grown engine called the CBCFoundation. An entire toolchain was developed to work alongside the engine including a level editor, skeletal animation editor and animator. Unfortunately, a hard disk failure meant that I'd lost the source files for the majority of the art assets. It was an event which the project never recovered from. Status: Incomplete - Abandoned due to hardware failure. A variant on the old Lunar Lander game with a twist. You're in charge of a rocket which has to pickup and ferry spacemen from one part of the moon to another. Instead of using retro thrusters to control your descent, you have your main rocket which you must rotate around to move and slow down. Landing on the pad was tricky, you had to land at just the right speed and at the correct angle or Kaboom, however you could take some damage by hitting the mountains - making a horrible metal scraping sound as the rocket takes a pounding. I just couldn't get this game working as well as I wanted. The framerate suffered due to software rendering and the engine did not allow for the level of fidelity in the terrain I wanted. I would later rebuild this in Unity as an example, however it wasn't as good or as much fun as I'd hoped and was ditched. 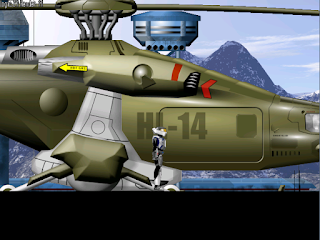 A 3D version of Anomalous written using the Torque engine. This game was going to be the version of Anomalous it was meant to be. The earlier version being abandoned following a horrific hard drive failure. I created a lot of art assets however it seemed that no matter how many assets I created, I always needed more and the better I got at creating 3D assets, the worse my earlier work looked in comparison and my animation was horrible. Compared to professional offerings, I couldn't seem to compete. I needed to rethink this game. However I had a story fleshed out - just like the original attempt. It was just too big for a single person to build. 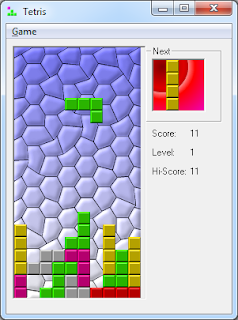 An example of how to build a tetris game, built in a weekend and offered on-line as an example. It was fully functional and surprisingly addictive, which I suppose goes to show how close I was to the original. It is an exercise that every game developer should do. Status: Complete - Released for free. A 3D version of GUNS written using the Torque engine. 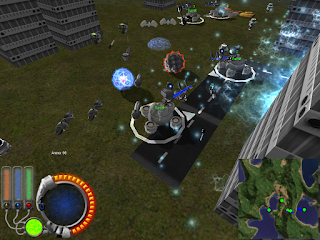 A fully 3D version of the original game complete with a story about aliens using the Earth as a kind of courtroom to settle petty disputes with squad based tank combat. The human race being powerless to stop them, but the aliens appear oblivious to their plight although seem to have no designs on taking over the world. Abandoned due to complexities with the Torque engine in making it do what was needed for this game and because 3D games need a lot of good art assets in order to look even nearly nice. It became obvious that alone I wouldn't be able to make this game no matter how much work I put into it. 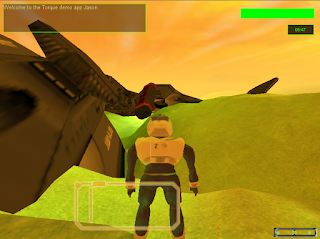 A back to basics reboot of GUNS with the intent to turn it into a completed game for sale. As the original however with the inclusion of multiple environments, better AI, refuel dropships, different turrets, friendly AI behaviour, A roster of pilots and a plot involving rival factions who do battle on the earth as their chosen combat zone.It even had a tutorial. It was abandoned due to the realisation that the CBCFoundation's inability to use hardware rendering had made it effectively obsolete. I'd also come to the conclusion that it wasn't that much fun to play. Control a person inside a game of Tetris. The person clambers and vaults over the blocks in the arena to get into positions and calls the blocks into position and rotates them. The blocks are held by a chain of increasing fragility - it will eventually snap sending the block crashing down. The player can also request the drop however in either case, it's best to be out of the way when they fall or you'll get squashed. Multiple levels, 4 environments, power-ups. Character graphics were captured from real-time video and roto-scoped. 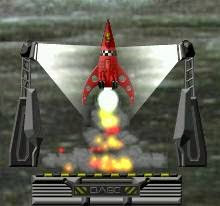 Winner of the Pascal Game Development group's 2007 competition. Published in 2008. This was the last game I wrote using the CBCFoundation and Pascal for that matter. The CBCFoundation's inability to handle hardware rendering without a massive upgrade almost killed it, but it was the advent of C# and pascal's descent into obscurity which finished it off. Status: Complete - Released for sale. 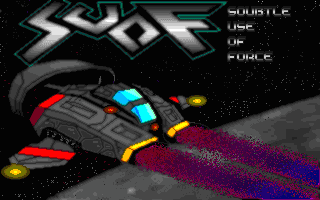 A conversion of the DOS based vertically scrolling shooter. I started it as an exercise in getting a mobile game developed, to understand the technical requirements as well as the development process. I hooked in the tilt controls to act as steering and on screen buttons for firing. Unfortunately, it was slow and clunky requiring far more work than I had time for at the time. It also ran differently on different phones. It served as a insightful prototyle. A science experiment has gone horribly wrong and you are called in to make it all better. Effectively a spiritual reboot of Anomalous. 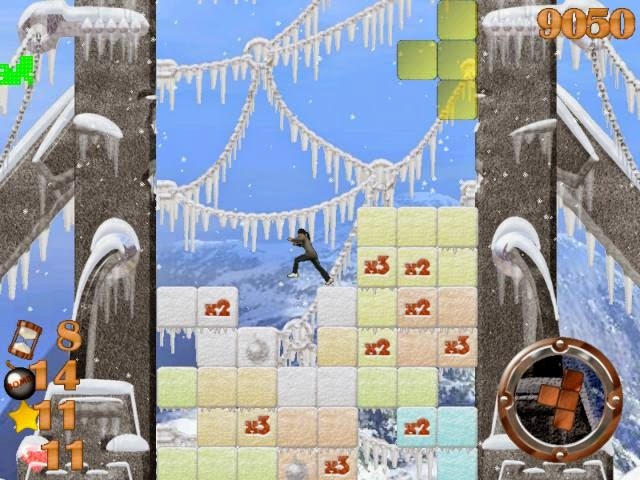 A platform puzzle game using live action footage captured against a greenscreen. Multiple characters and a story. This game is still in development but features physics as well as logical puzzles. 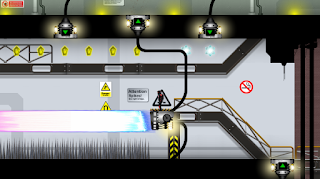 A key feature of the game is that the main character does not resort to violence - instead solves problems using intelligence, the environment and science. Control a person inside a game of Galaga. The live action greenscreen captured person fires energy bolts from their hands at increasingly difficult waves of enemies. 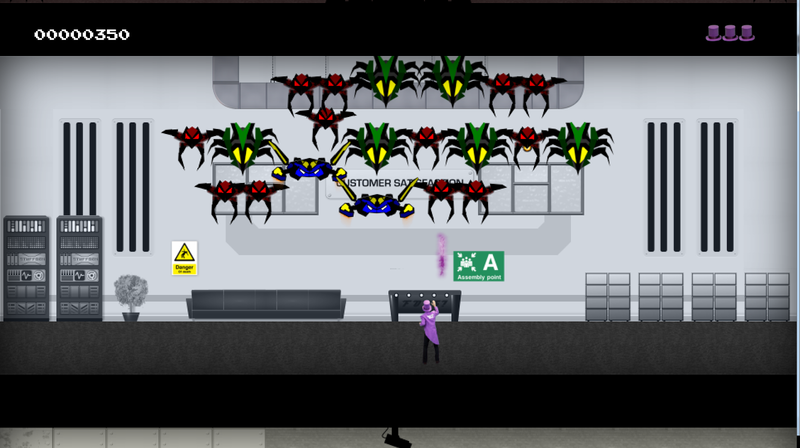 Complete with Boss creatures, all aliens have their own set of abilities and tricks. Completed and presented at an Insurance trade show. Status: Complete - Released for Trade show. An endless runner where you have to rescue little Timmy from the well. 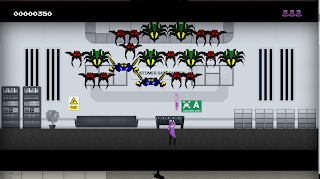 Designed to be completely cross platform and created during a GameJam in January 2015. The game is notable for it's responsive controls, Spine animation and speed.The game was polished up over a period of 3 months and released on Android, OUYA and iOS. We have a project on the go at the moment, which we'll announce shortly. The result of the second Songbird Creations Game Jam.